At the RSC we are always looking for new ways to distribute NewsFeed. 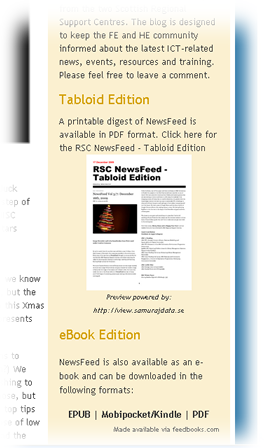 Around this time last year we introduced a printable PDF digest as ‘RSC NewsFeed Tabloid Edition’. This document is automatically created by a free 3rd party web service, tabbloid.com, and added to our navigation column via the Make Tabbloid plugin. With the growing interest in ebooks we have now added ‘RSC eBook Edition’. The eBook Edition is automatically generated by an external web service called feedbooks.com. As a single ebook standard is yet to emerge so NewsFeed is available in 3 different formats: EPUB, Mobipocket/Kindle and PDF. Permanent links to the latest edition of NewsFeed in these formats have also been added to our sites navigation column. For more information on how to generate ebooks using feedbooks we used step-by-step instructions posted by Joss Winn at the University of Lincoln. If you need more help please post a comment below.